Around this time last year, we wrote an article highlighting the increasing signs of speculation and euphoria we were seeing in the burgeoning cryptocurrency market. Our skepticism had less to do with the merit or potential use of cryptocurrencies, and more to do with the prevalence of telltale signs of a bubble. While the jury may still be out on cryptocurrencies as a whole, there is no doubt that sentiment has cooled off significantly as nearly all have recorded significant declines in value. As we enter the final quarter of 2018, we are seeing increasing buildup in another area – cannabis companies. While the fervor we are seeing around companies in the cannabis industry is reminiscent of last year’s crypto craze, that is more or less where their similarities end. Despite being a relatively polarizing topic from a political standpoint, marijuana has a long history of medical use treating conditions ranging from seizure disorders to Crohn’s disease. Additionally, nine U.S. states have now voted to legalize recreational marijuana use with several other states likely to follow suit in the near future. With this backdrop, it is not surprising that companies involved in the marijuana industry are starting to get more investor attention. In this article we will take a brief look at the current landscape in the cannabis industry and offer our opinion on the merits of investing in this space. Marijuana use was federally outlawed in the 1930’s via the Marijuana Tax Act which was replaced in the 1970’s by the Control Substances Act (“CSA”), a law that still stands today. The CSA established schedules for ranking drugs according to the perceived danger (numbered 1-5, 1 being the worst) and potential for addiction. Under these parameters, the federal government declared marijuana a Schedule 1 drug placing it in category alongside heroin and LSD. Since the CSA was originally passed, Americans have become much more receptive to both medical and recreational marijuana use. In 1996, California became the first U.S. state to approve marijuana use for medical purposes. Since then, 30 states have passed legislation making marijuana use legal in some form (medical/recreational), and a recent poll found that 68% of Americans now support outright legalization of marijuana. In 2016, voters in California passed legislation legalizing recreational marijuana use immediately making it one of the largest growth markets in the world for cannabis. Momentum continued outside of the U.S. as well, with Germany voting to legalize medical marijuana in 2017 and Canada opting to legalize recreational use earlier this year. Additionally, despite having a Republican majority (who have typically voted against advancing marijuana legislation), the current Congress has sponsored 41 marijuana reform bills, 27 in the House and 14 in the Senate. The 14 bills in the Senate are more than the total number of marijuana related bills seen in the previous 17 years combined. With the rapid move to make marijuana use legal at the state level and the appearance that federal legalization is inevitable, the number of companies operating in the marijuana industry is skyrocketing and investors appear to want in on the action. Due to the fact that marijuana is still illegal on the federal level, U.S. based companies cannot be listed on U.S. exchanges. Because of this, U.S. based companies who wish to go public often choose to list their stocks on Canadian exchanges. Oddly enough, the U.S. has no rules against international cannabis companies (where legal) to list on U.S. exchanges, so there has been a recent influx of Canadian companies listing their stocks on U.S. exchanges (confusing, I know). To oversimplify things, the majority of large cannabis companies have one of two structures. They operate either as a pharmaceutical company aimed at developing cannabis-based medicine, or are vertically integrated organizations that do everything from growing and cultivating plants to operating the dispensaries and retail stores. There are numerous companies that also play niche roles within the cannabis supply chain but the largest players typically operate in one of these two fashions. The market that these companies aim to tap is already surprisingly large at $8.5B and is projected to grow to $22B by 2022 (27% annual growth). Given the size of these markets and the growth they are expecting, it is not surprising to see large amounts of investor capital pursuing new ventures. As the level of fanfare steadily increases, state and local governments are also quickly realizing the potential the industry holds. For example, states with mature legal marijuana programs (OR, WA and CO) have collected an estimated $1.3B in recent years. Additionally, according to New Frontier Data, the U.S. Federal Government could stand to take in over $100B in retail, payroll and other business related tax revenues by 2025 if marijuana were legalized at the federal level. With the industry set to grow rapidly and the potential for increasing legalization, investing in marijuana stocks is a no brainer right? Not necessarily. As with any investment, it is paramount to do thorough due diligence on a company’s business strategy, its finances and operations, as well as the management team. Additionally, it is incredibly important to assess whether or not expectations for future growth are already built into the price you are paying for these stocks today. At the moment, it certainly appears as though this is the case. Let’s take a look at some examples: Tilray Inc. and Aurora Cannabis are two of the largest Canadian marijuana companies that are listed in the U.S. 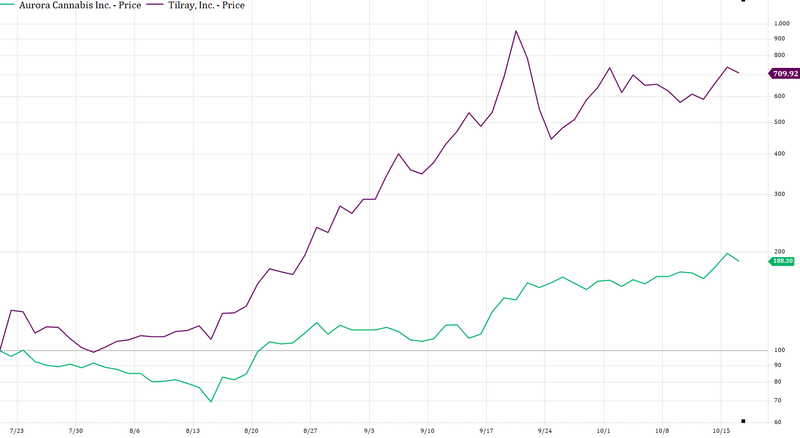 Looking at how the market is currently valuing these two firms, Tilray trades at a price-to-sales ratio of roughly 100x, while Aurora Cannabis trades at roughly 22x. If these companies were in the S&P 500, they would rank as the first and second most expensive firms in the entire index. As of October 15th, the two companies have a market value in the range of $13B to $15B dollars – staggering numbers for entities that generate relatively little in revenues and aren’t profitable yet. To help put this in perspective, let’s look at another company with a similar market value, Conagra Brands, owner of a variety of consumer brands in the U.S. Conagra currently trades at under 2.0x price-to-sales and generated over $7.5B in sales last year. Tilray and Aurora each generated under $45MM in revenues for the full year while Conagra generated $30MM in revenues every day of the year. Put another way, Tilray and Aurora would have to grow their revenues 100% every year for the next seven years in order to surpass the level of revenue Conagra generated last year. Tilray Inc and Aurora Cannabis are up 609% and 87%, respectively, since July 19th, 2018. Does all of this mean that you should avoid any and all companies that participate in the cannabis industry? No. The main problem that we currently see with publicly traded cannabis companies is that there are simply too few of them. Scarcity value has been the biggest driver of the public cannabis company’s success thus far but this is unlikely to last. As time goes on, our expectation is that you will see increasing levels of legalization and along with that, an increasing number of investable options. When this happens, valuations will likely compress as investors allocate across a broader spectrum of investable assets. We acknowledge that it can be challenging to be patient when there is a high level of excitement around an industry but in this case we believe patience is warranted. This remains a fascinating area of the market and one that we will be sure to monitor is it continues to develop over the next several years.